These hot knife Thermocutters (hot knife cutter) feature an electrically (110V) heated blade designed for cutting all thermoplastics easily and effortlessly. Heats up instantly. Transformer steps voltage down to a safe level. Cuts through foam-like material up to 5 inches thick. This hot knife Thermocutter is designed for continuous, industrial operation— including on-off batch production, use at a central work station or on-site. 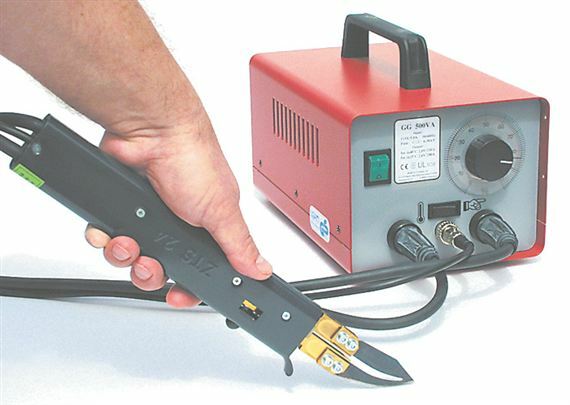 The ZETZ-24 Hot Knife can be set for on/off operation or continuous use with the flip of a switch. Blades are changed quickly and easily. Temperature of the blade is adjusted by the variable controller on the base unit. This ensures that the blade is evenly heated to the temperature suitable for the application. For automatic operations requiring the cutting blade to be built in, there is a special robotic handle (ZETZ-25) available at the same price. Our ZETZ-25 EOAT mountable handle version is for automated applications such as robotic end-of-arm tooling or static mounted in-line cutting. Control Unit Dimensions: 7½" x 8½" x 117/8"